Residents of Southwest Healthcare Services’ long-term care facility will soon be able to able to enjoy the outdoors again. 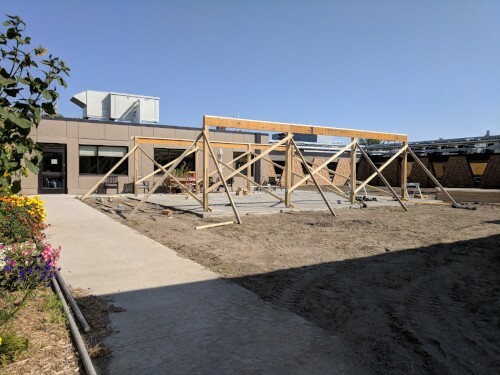 Construction is currently underway for a new, 25 ft. by 30 ft. patio that includes a canopy, allowing residents to spend time outside, even if it happens to be raining. With the construction of the new facility, and the expansion of the indoor activity space, the residents lost space outside. Residents, staff, friends and family were limited to a sidewalk that borders the exterior of the activity room. The residents and staff felt the absence of their outdoor area and knew that something needed to be constructed. So talks about a potential project began to grow into planning. Activities Director Melissa Olsen said that they wanted something that would be safe for the residents, and began thinking with a budget in mind. The project is being funded completely by proceeds from Southwest Healthcare Services’ annual fundraising event, Celebrity Water Dinner. Local contractor R & L Contracting is constructing the new structure, and Olsen said when it’s finished, the residents will have another outlet for enjoyment. “This will definitely give back their independence, give them sensory activity of sight, sound and smell,” Olsen said. She also said that friends and family will also be able to enjoy it when visiting residents. Celebratory events will also have another optional location, with the added pavilion.